You Are Here: Home > Welcome to Ray Catena Motor Car – Mercedes-Benz in Edison, NJ! The Tri-State Area’s most trusted Mercedes-Benz dealership. My name is Tim Antoniszyn and I look forward to helping you find the perfect Mercedes-Benz. When it comes to New and Pre-Owned Mercedes-Benz vehicles we offer the finest in Sales, Selection & Service. 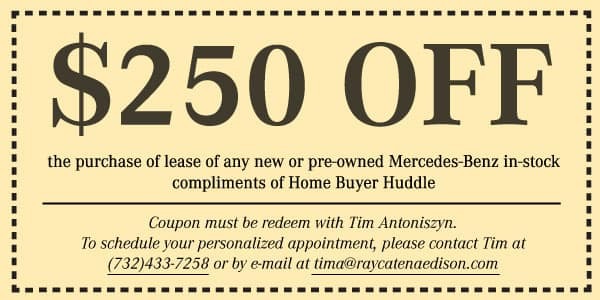 Print or screen-shot the coupon below and receive an additional $250 OFF the purchase or lease of any new or pre-owned Mercedes-Benz vehicle.